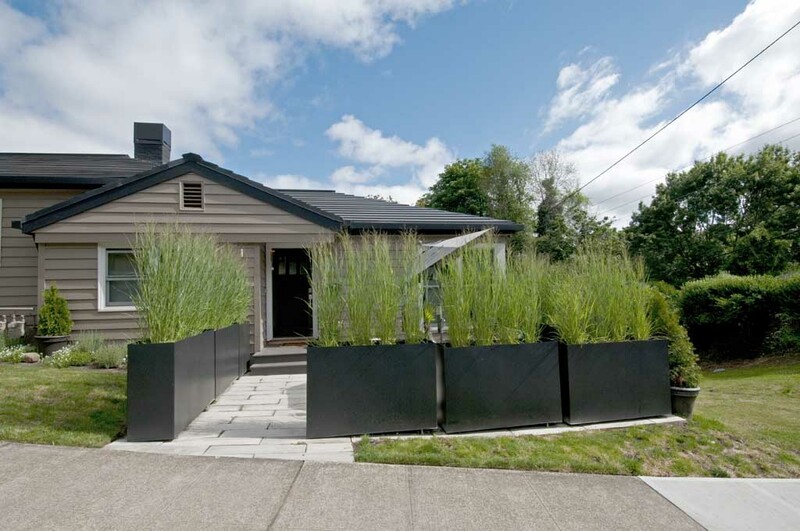 These steel planters and patio design was done for a client who lives on a busy street and wanted to utilize their front yard as a place to enjoy the south sunlight while having a buffer to busy traffic passing by. The planters are made of 14ga steel and are approx 14″ wide x 36″ high x 44″ long (varies), have drainage pans, adjustable leveling feet and are powder coated a dark brown/black. The planters were filled with round river rock as ballast and drainage , then a loamy sand and gravel mix and capped off with top soil. Ornamental grass where planted over the winter and have taken root nicely as spring arrived. The would also make excellent natural space enclosing patio walls for office or restaurant uses as well. We can offer these as a rhizaA+D product in large variety of powder coating colors , as well as, minimal maintenance weathering steel (corten) or a hot dip galvanized finish. Get in contact with us for sizing, material and pricing options.